The back end of the conversation is the beginning of the conversation. Twitter so far has been the best ally to conferences, unconferences and the tearing down of walls. It has brought more interconnectedness than we had probably imagined possible the day we wrote our first blog posts. The edublogosphere is becoming more open to different circles of contacts and except for one or two star edubloggers, they all -including this star- tend to open up to hear from a wider circle of 'friends'. We seem to be experimenting with being closely linked to an ever-growing and far-reaching circle of contacts. We all want to create experiences as synchronous or near synchronous as possible. We are far from the days when blogging was writing the quiet, lonely reflection and then press publish to reach others. Now the reverse is happening, valuable ideas arise when like-minded people strike up conversations which will, in turn, prokove thoughts that will be perpetuated in blogs or wikis. A kind of everlasting conference springing from a muted chat conversation at the back of the room. As the Twitter tool has limits for this new need, so Skype chatting came into the picture and the Chatcasts were born. What have we learnt from the experience? -There is a unique added value to the just-in-time, in-the-moment connectedness. We need more of that. -In spite of the speedy style of a chat with 40 or more participants, it is an opportunity to share deep reflections for those who have been reading each other for a long time. -Chatcasts, just like face-to-face conferences, are also a chance to make new connections with like-minded people, who could perhaps have met anyway -at a much slower pace- in a blog comment thread. Perhaps not an experience to suit all learning styles, but meaningful conversation can spring from people looking over the shoulders of attendees. Streaming and archiving the chat can be as valuable as the presentation podcast itself. Edublogosphere.com, a future centralized back channel? It is the word centralized that makes me wonder. I agree we need another venue for informal back channelling. But not a mere alternative to Twitter. I think we have to review our chatcasting experiences and try to push them to the next level. What were the drawbacks of chatcasts? -Someone must captain the chat. This person will be somewhat overworked. -There is a limit to the number of people you can join in the conference mode. -You need to have the Skype contact name; get it on time. -A privacy issue. It is necessary for the captain to add new contacts to his Skype, which he may or may not be interested in keeping afterwords. -How do you get to know if the next conference you cannot attend will have a back channel option of some sessions? The first announcement of a chat could come from anyone in the Twittersphere attending an event somewhere in the world. Unless it is your own presentation and you announce it in your blog ahead of time, it takes good luck to come across a tweet with an invite. All in all a fairly formal process to get to backchannelling. I think that part of the success of these online meetings is that the enthusiasm you experience resembles a face-to-face encounter at the coffee break in a conference. Lively and mostly informal. What do we need for future synchronous conversations? About creating a site which can be the 'centralized' place to announce events... I believe a calendar in EdubloggerWorld is a far better option. It is open to groups in other languages and we can probably profit from interchange with an 'interpreter' and captain making the back channel of a conference in another country. Backchannel could be a way to go beyond barriers of place, time and language. But the marvel of it all -so far- is how simple it is for anyone, to put people in conference mode. It only takes a Skype account, plus Twitter. Choose a tag and you continue conversing in blogs; paste the script to a wiki and let readers (even those who missed the sync chat) start forum threads. So flexible and distributed. You do not even need a conference as a starting point. The need to chat could start with any collaborative task. More than a need to centralize it, there is a need to make it as open as possible. That is what http://worldbridges.net./ achieves. We also need to make it transparent. Something that tells you who is there with you, as a meebo chat or a Google doc that tells you who is editing. -No passwords. No sharing personal IDs unless you want to. 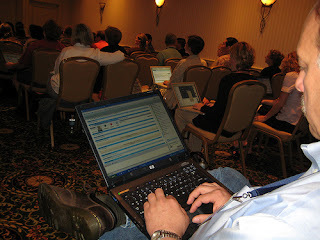 -Ease to integrate to other online 'events' -not just conferences- e.g. provide the archivable chat that a google docs does not yet have. How will this communication need translate into a form and content? That is, it would be great to separate form and content. Tool and venue. I think we need a place on the one hand and a tool on the other. That's why the word centralized leaves a bug buzzing in my head. The tool could be the centralized aspect; but conversations are, by nature, distributed. After all, isn't the whole idea of back channelling a conference a way of shifting the conversation focus to the attendees and their blogs instead of the speaker at the conference centre? Chatcasting: A Summary. By David Jakes, August 26, 2007. A chatcast I took part in... This is a chatcast example archived in a wiki. Some reflections on that experience by the chatcast 'Captain'. Chatcasting from a Management Perspective. By Terry Freedman, August 15, 2007. A year ago I presented my my first blog for students, The FCE Blog, at Teacher's Day in front of 50 of my co-workers at the BAC, the theatre of the language school I work at. A translation of this presentation into Spanish was published in an interview at Educ.ar, the Argentine Ministry of Education blog, which opened the door for me to meet the Spanish speaking edubloggosphere. A most rewarding learning experience. It was viewed over 2,500 times at Slideshare and favourited by 20. For all of you wondering whatever I said there, here is the English version of the interview. I must say I love my first blog. I have used its name/logo as my avatar. Sometimes -not too often- I miss the days when I had no idea there was a network of edubloggers around. I made me focus more on my ideas. Definitely what I produced before September 2006 was purely original content. Somehow ignorance helped me to write unhindered from thoughts such as, hasn't anyone done this before? Shouldn't I build upon what others are doing? Once you are connected, I believe you assume the responsibility of not reinventing the wheel. I did check there was no like of it around the web. There was not. In April 2007, the blog got a mention as an example of the ELT Tutor blog in the book How to Teach English with Technology published by Longman. The students' reaction to this was 'We are making history'. I think the blog showed there are simply no more walls in our classroom. Personally, I am so glad Stephen Downes has included The FCE Blog in his Edu-RSS feed list of edubloggers. All in all, a successful presentation. As I have been asked to present again, I am reviewing it. Some core ideas I still find relevant; but others have changed under the light of the knowledge gained in the last six months. I do not have answers yet. I get stuck and need help. I am posting the questions and hope you make me think. (Contributions will be properly acknowledged and linktributed in a future post). Can we still use the concept of "digital natives versus digital immigrants" to explain the divide between teachers and students? Students use msn, fotologs (highly popular in Argentina) and text incessantly. When I speak of blogs, wikis, del.icio.us or Flickr, I am speaking a new language to them. I am not trying to integrate the same technology they master to my lessons. I am introducing new tools which are far more social than a private mail, chat or text message. Learning and sharing with the whole world has, so far, been pretty innovative to them. They do not adopt blogs and wikis at the touch of a button. You can expect a series of adoption resistance moves before the whole class gets engaged. How can student blogs be best moderated? Reading class blogs, mostly ELT, it is hard to find lots of blogs flooded with student comments. Moderation and word verification seem to be rather off-putting. Moderation in itself is a top-down activity, which somehow makes the course blog a teacher-centred place in the end. In order to engage students in writing their reflections, is it better to blog in class or at home? Do students reflect more in blog posts of their own or in comments? This question is connected to the idea of assigning posts or comments as homework. When I think about my own learning as a blogger, I can connect anywhere, but I still find my home the best place for writing reflections. I can come up with an idea for a class anywhere; however, I would not have developed a whole blogging project on a school computer. Now that digital literacy is not so time consuming, I find it a lot easier to make myself home in a public computer. Not that these are the only questions in my mind now. But let's say it is enough for one post.